High-profile backrest supports back during extended sitting periods. High-density foam maintains the back’s natural curve to promote neutral posture. Adjustable strap holds cushion in place. Soft brushed cover removes for cleaning. 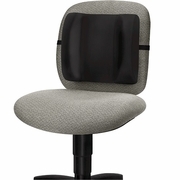 High-profile backrest supports back during extended sitting periods. High-density foam maintains the back’s natural curve to promote neutral posture. Adjustable strap holds cushion in place. Soft brushed cover removes for cleaning.